View of the Borexino "Stainless Steel Sphere" (SSS) from from the "Water Tank", before cables and PMTs installation. (PhysOrg.com) -- The Borexino collaboration of about 80 scientists from six countries, who have been working with a detector buried 1.5 km beneath the Gran Sasso mountain near l'Aquila in Italy have detected geo-neutrinos, which are electron antineutrinos created by radioactive decays inside the Earth's mantle and crust. Neutrinos are extremely inert, chargeless, fundamental particles of almost zero mass that are emitted by the Sun and created by cosmic rays arriving on Earth. They have been the subject of research for many years, and studies of them have increased our knowledge of the physics of the Sun. Geo-neutrinos are electron antineutrinos that are created inside the Earth when radioactive nuclei of elements such as thorium and uranium decay. Measurements of the flux of geo-neutrinos may help scientists understand how much of the Earth’s internal heat is caused by radioactive decays, and this could increase our understanding of processes arising from convection currents within the mantle that affect movements of the tectonic plates and volcanic activity. 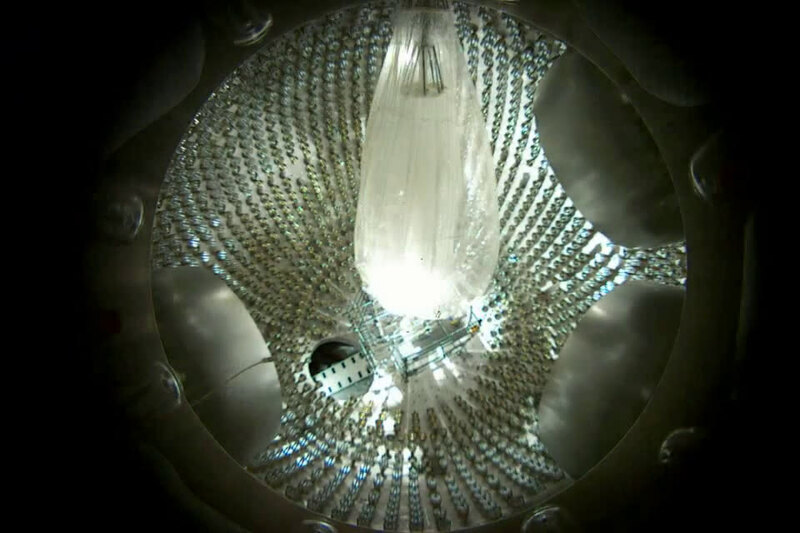 Detecting any kind of neutrino is difficult since huge volumes of detector material must be used, and the detector must be deep underground to avoid interference from cosmic rays. Solar and atmospheric neutrinos can be studied by their interactions with heavy water nuclei, but signals from geo-neutrinos would be swamped by the radioactivity in the heavy water, and so the researchers used hydrocarbon materials instead. A geo-neutrino passing through the hydrocarbon can collide with a proton to create a neutron and positron, and this collision generates a dual gamma-ray emission and small burst of detectable light. Geo-neutrinos were first detected by Japanese researchers in 2005 during a project known as the KamLAND experiment. Their detector was in a mine one kilometer underground, and was located close to several nuclear reactors, since the team was studying reactor antineutrinos. They had to separate the geo-neutrino signals from the stronger antineutrino emissions from the reactors. In the current two-year study, named the Borexino experiment, there were no strong background signals because the nearest nuclear reactor is hundreds of kilometers away. The detector, photomultiplier tubes and liquids used were also specifically chosen because of their low levels of intrinsic radioactivity. 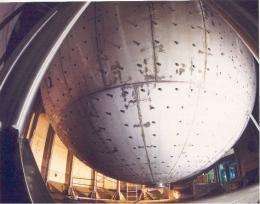 The aim of the Borexino experiment was to detect low-energy solar neutrinos in a detector comprising 300 tonnes of pseudocumene, a doped hydrocarbon fluid, encased inside a nylon sphere. The sphere was encased inside a stainless steel sphere containing 1,000 tonnes of pseudocumene and lined with 2,200 photo-sensors capable of detecting single photons of light. The steel sphere was suspended in an 18 meter diameter steel tank containing 2,400 tonnes of highly purified water. During the experiment, 9.9 geo-neutrino events were detected, with uncertainties of +4.1 and -3.4. One of the researchers, Professor Gianpaolo Bellini from the University of Milan, said the results rule out the hypothesis that most of the planet’s internal heat is generated by a uranium-fuelled nuclear geo-reactor in the Earth’s core. Several larger experiments are being planned, including one in which a 10,000 tonne detector would be built on the bottom of the Pacific Ocean, where the Earth’s crust is very thin. Professor Bellini said the experiment marks the start of a new era in the study of Earth’s interior. -- The group's paper will be published in the Europhysics Letters B and is available on Arxiv website. they are going to build a detector on the bottom of the pacific -- or are they going to build a reactor and let it sink to the bottom of the pacific -- and where in th epacific are they going to drop it. And these guys sneer at the stats thrown up in Psi expts!